A report says that President Donald Trump and his family were not served any romaine lettuce during their Thanksgiving dinner. 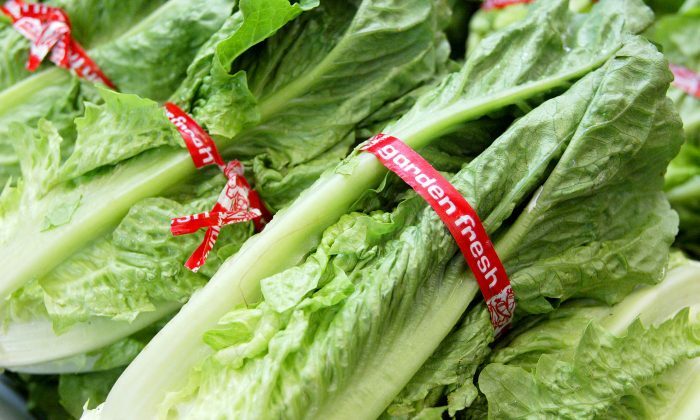 U.S. health officials have warned that romaine has been linked to an outbreak of E. coli that has left about three dozen people sickened in several states. The White House told NBC News that the menu at Trump’s Mar-a-Lago estate in Palm Beach, Florida, included Caesar salad, but it had no romaine. Romaine is the typical base of Caesar salad. The rest of the holiday menu is a “full salad bar to include Caesar, wedge, tomato/mozzarella and Greek salads, deviled eggs and duck prosciutto & melon … chilled seafood display with Florida stone crab, oysters, jumbo shrimp and clams … a carving station with turkey and all the trimmings, beef tenderloin, lamb, and salmon,” according to the report. Also sea bass, snapper, short ribs, potatoes, and traditional stuffing were served as well as a number of desserts. The NBC report suggested that if Trump and his family were served romaine, his U.S. Secret Service agents would first have to test it. Food and Drug Administration (FDA) Commissioner Scott Gottlieb said on Nov. 22 that his agency is still working to figure out the source of the outbreak, which has left 32 people sickened, including 13 who have been hospitalized. It comes two days after the U.S. Centers for Disease Control and Prevention (CDC) sent out a warning, saying that all romaine lettuce is suspect and shouldn’t be eaten. Officials said any romaine should be thrown out until further notice.“Consumers who have any type of romaine lettuce in their home should not eat it and should throw it away, even if some of it was eaten and no one has gotten sick,” the CDC wrote in a notice on its website on Nov. 20. Illnesses have been reported in California, Connecticut, Illinois, Massachusetts, Maryland, Michigan, New Hampshire, New Jersey, New York, Ohio, and Wisconsin, the CDC reported. In Canada, 18 people have been sickened with the same strain of E. coli in Quebec and Ontario, officials said. But the FDA, meanwhile, has said it is working to trace the source of the E. coli-tainted lettuce. “At this stage in the investigation, the most efficient way to ensure that contaminated romaine [lettuce] is off the market would be for [the] industry to voluntarily withdraw product from the market, and to withhold distribution of romaine until public health authorities can ensure the outbreak is over and/or until FDA can identify a specific source of contamination,” the FDA stated.